Reading is one of the four skills of language which is very important. Formal education begins with reading. A child enters the greater territory of knowledge through reading. Reading with correct pronunciation and spontaneity is considered as reading-skill. In this case, reading with understanding, grammatical correction, elaboration of thought or summarization is not mandatory. Appropriate preparation is necessary for all the students. When a student of grade 2 can read forty words per minute, it is considered that the student has achieved the reading skill as per international standard (this standard is followed by the USA for reading English Language). We do apply this method though. And at the end of primary level, if a student can read 60-65 words per minute he is considered to have achieved the reading-skill of primary level. Well, in this case we can take help of a wristwatch or a stopwatch. As Bangla is our mother tongue, we can achieve this skill effortlessly. Forty words per minute means less than a word per second which is very possible. Concentration should be given to this. A child tries to speak after seven or eight month of its birth. Then, why after seven or eight years, when he is in class two or three, will not be able to read effortlessly. The textbooks of primary level such as Bangla, Mathematics, Bangladesh and Global studies, Science, Religion and Moral Education and even learning English with Bengali meanings all are related to Bangla Language. That means, if any student can achieve reading skill in Bangla, he will be able to read the other subjects too. Whenever we, the Education Officers, go to primary schools for first-hand inspection, we let the students read from their textbooks, read joint letters and difficult words to check their reading skills. Most of them can read spontaneously, some of them can read with the help of their teachers and a few of them fully depends on their teachers. Sometimes, the result does not come as per our expectation. This is high time we overcame this situation. A few days ago, the secretary of the Ministry of Primary and Mass Education Md. 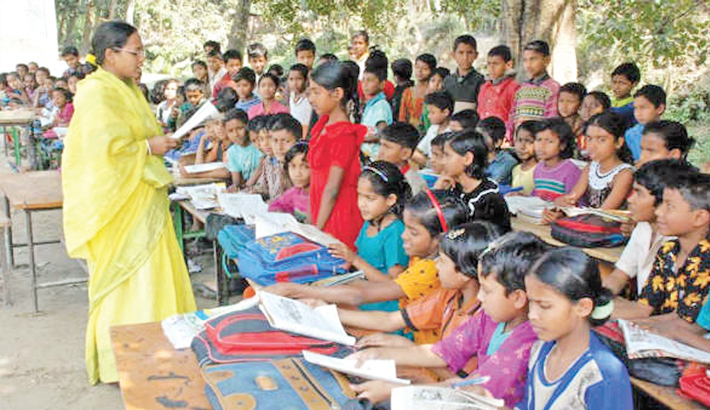 Akram-Al-Hossain gave some instructions to develop reading skill of the students. The instructions include one page reading homework daily, class teachers making all students read loudly at the beginning of the class, and teachers reading aloud so that the inertia of pronunciation can be removed and standard pronunciation style can be set. Besides, the secretary gave instruction to take necessary steps to develop confidence among students through arranging pronunciations competition. At the same time guardians should come forward to develop their children's reading skill. If every mother makes his child read at least one page regularly and she herself reads loudly with her child, their reading skill will be increased. Students should make a habit of reading newspapers and story books which will enable them to become a spontaneous reader.